read Luke 23. When I was young, in a fit of rage I threw a heavy garden metal stake straight at one of my lovely handsome nice athletic brothers. I was furious at him. I don’t even remember why. He says to write that I “split his forehead from his eyebrow to his hair.” By the grace of God, it hit him just above the eye and left only the tiniest of scars. And he’s never mentioned it again. What happened? What happened was that I had not been sorry, not one bit, up until that moment ten years ago. It never occurred to me to be sorry. And that was why the incident got dredged up – because it needed an apology. By truly being sorry, the incident was finally put to rest. But what else was going on there? Why had I never been sorry? I don’t know, but I think it has something to do with the Holy Spirit. I think there is a sense in which we don’t really know what we’re doing until God reveals it to us. I like to think that what happened was that one day, ten years ago, the Holy Spirit whispered truth to me – that what I had done was terribly wrong – and said it in such love, that I was able to hear it. 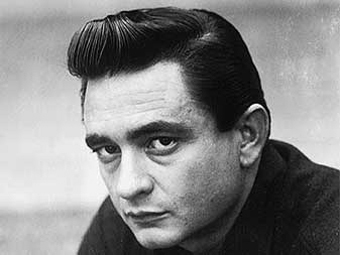 The genius of the song lies in Cash’s ability to capture both truths – depravity and remorse. Cash has said he tried to get at truth when he wrote the Reno line: “I sat with my pen in my hand, trying to think up the worst reason a person could have for killing another person, and that’s what came to mind.” The prisoners’ cheering to the Reno line was supposedly added post-production – but who cares. People love the cheering. The cheering is part of what has made the song so famous. So why did the narrator of Johnny Cash’s song cry when he heard the train coming? Was it really remorse? Or was it self-pity? It’s hard to tell if the singer is really sorry – and that, too, is part of the song’s genius. He’s sorry he hasn’t seen the sunshine. He’s sorry he’s not in the fancy dining car drinking coffee and smoking big cigars. But there’s a hint of more in the sound of the train whistle itself. The whistle is like the mourning of the dove, that touches something inside of us. The train whistle suggests that the narrator is sorry not just that he didn’t listen to his mother when she told him not to play with guns – but that he must have broken his mother’s heart. Like all great artists, the way Cash performs the song adds to the pathos. If you watch the video linked above (where he’s performing in San Quentin), his lips curl when he sings the Reno line. But when he gets to the part where he admits he hangs his head and cries, his voice goes low. It’s not the uptick of teenage girls, it’s the deep passion of a man who knows he is paying the price for his depravity. It’s the passion of a man who might, just might, be sorry for what he’s done. So why, just after Jesus was crucified, did Jesus ask God in Luke 23 to “forgive them, for they don’t know what they’re doing”? Is that true? Do we really not know what we’re doing? And who is the “they” Jesus was talking about here? If you’ve read the Bible, you will know that it was not “the Jews” who crucified Christ – it was all of us. The “they” is “us”. Whether we shoot a man just to watch him die, or we throw a metal stake at a brother in a fit of rage, we are all hammering nails into God’s hands. That, I think, is one of the reasons Jesus said we don’t know what we’re doing. We have no idea how bad our sin really is. We have no idea how deeply it grieves our Father. We have no idea of the price Jesus had to pay for the evil in our hearts. We have no idea of the tears we are ripping in our own souls. This brings us to the other puzzling part of Luke 23. Why is Jesus silent in the face of his accusers? They are telling lies about him. They are shouting lies, in fact. Scripture says that the shouting prevailed over the silence. So why doesn’t God defend himself? It doesn’t make any sense. But there, in the thing that seems to make the least sense to us, lies the stunning truth about grace. When the crowds yelled those accusations at Christ – they were condemning themselves. Judgment screamed, while Love stayed silent. Judgment cried out, “he deserves to die,” while Love let the truth sink in that the person who deserves to die is each of us. We are all Barrabas – the “murderer” set free because an innocent man takes our place. Are we really that bad? Yes. But knowing this can move us not to self-hatred but to gratitude. There is self-hatred all over this chapter. It’s evident in the ranting of the crowd. They are raving about themselves, about their own sin. The good news is that another strain runs through this chapter, just as it does through Fulsom Prison Blues. There are three humans who “get it” here. The Roman Centurion, there to oversee the crucifixion (and so beautifully dramatized in the novel The Robe), says in wonder: “Surely this man was the Son of God.” One of the robber being crucified alongside Jesus is saved right there on the cross, as he cries out the truth that saves us all: “I deserve to die, but this man has done nothing wrong. Jesus remember me.” And Joseph of Arimathea, did not agree with what the others had done, and did the little that he could; he paid for a tomb for Christ’s body. What was different about these three people? While the crowd ranted; while Jesus’ friends stayed “at a distance”; these three stepped closer and looked. These three hold out hope for us all. If we do that, if we take the time to step closer and look at the cross, we find out the truth. The whistle train blows for our sin – and yet God let the train run Jesus over instead. The train whistle brings tears that pierce us, because if we ask God to show us what we’ve done, we discover that our behavior breaks His heart. When sorrow, true sorrow pierces us, we, too, are crucified, because our pride suffers, our false sense of ourselves as perfect has to die. But this kind of death has to happen in order to raise each of us to new life. And that new life is one of truth. It’s a life where God can finally show us the truth about what we’ve done, and where we can finally apologize to the people we’ve hurt, and finally be reconciled to them – assuming they are kind enough to forgive us. Letting God show us what we’re really doing hurts, but it softens our hearts. It causes us to cry. It melts us. And in so doing, it enables us to live in community. We are all prisoners, until Love sets us free. We are all singing the mournful blues in our heart, until God gives us a new song. We are all hurling objects at each other, until we discover that our Father loves us so much, he took the sharpened point of all those objects in his own chest. We can trust God, because He knew exactly what He was doing – and He did it for us.